I've been scouting for globes for a few months now because I've always loved having a quick view of the world to keep things in perspective plus I love to travel and they remind me of how excited I felt as a child when I first saw one in school, fascinated to find out that America was not the world, just a very small part of it (I think some adults still need this reminder). So I've been looking for the perfect blue sphere to add my credenza at home, but not a brand new one... Something vintage and a bit worn. And it must be blue. Like the one in this photo. So I went where everyone heads when they need a blast from the past, eBay. And get this, I won a tin globe last night, it's from the 30's in excellent condition, measuring only 10 x 7 so it's perfect for the spot I'm looking to place it. I was up against 25 others biddings on it so I was scared to lose because eBay collectors can be a bit psycho. Then along comes a non-collector like me and I won. That's the beauty of the auction. I can't wait until it arrives, do you like it? I like that the stand appears to be a gorgeous saffron yellow. I'm really excited to see it in person. Here are some globes on eBay if you'd fancy owning one yourself. Look at all the globes in this collection, aren't they gorgeous? I found this photo on Happy Mundane where stylish Jon mentioned that globes may very well be the next trend. 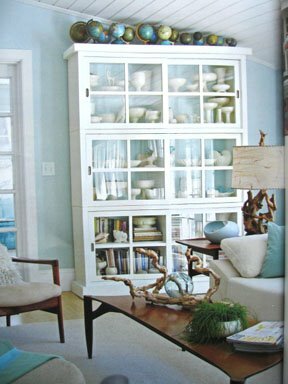 That image above is a picture from BH&G magazines taken in the beach home of a Boston couple (Aug 07). Maybe he's right, because I've been looking for globes since Spring and now I'm starting to see them popping up more and more, but not large old school globes, I'm finding smaller ones and even those without stands to pile in a bowl. 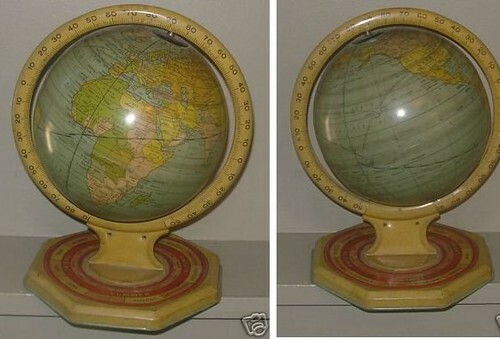 Here's a few I found just in case you've been looking to add a nice globe to your decor. But I'm not so sure about these, I'm way more interested in the vintage ones with the blue spheres. 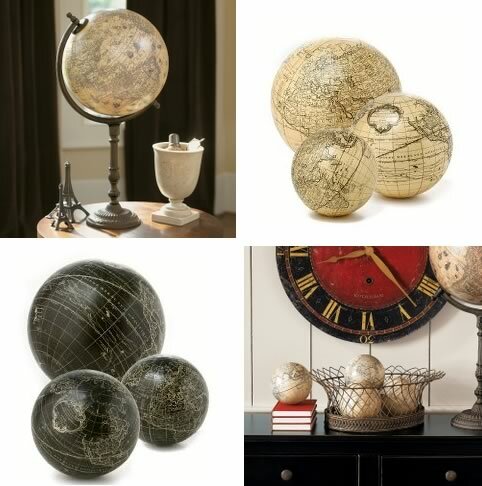 Here's some Parisian globes from Anthropologie (in black or cream), and a set of three globe spheres and a tabletop globe from Ballard Designs. If you find any blue reproductions, let me know. Otherwise, I think we all need to hit eBay for the vintage gems. They're so pretty! 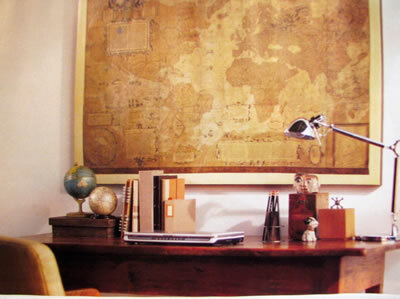 And if you aren't into globes, vintage maps make for beautiful art or use several to collage onto a wall to mimic wallpaper. I'd love to see someone wallpaper an entire wall with blue vintage maps. Reader Q: Italian Design Blogs?